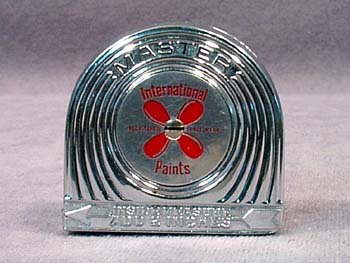 International Paints distributed this wonderful 6' tape measure as an advertising premium. Made by Master Rule Manufacturing, Inc. of Middletown, New York, it carries a 1937 patent date on the back of the chromed casing. The retracting metal tape is in superb condition, with no wear to the markings, and the case is in great shape also, with no rust or pitting. Measuring 2" wide, 1-7/8" high, and 5/8" deep, the flat bottom of the case allows it to stand alone.